If a pan containing grease or food catches fire, cover it with a lid and turn off the burner. Never pour water, or anything else, on a grease fire. If a pan fire starts in the oven — turn off the heat. Close the oven door to help suffocate the flames. If the fire does not go out, call the fire department immediately. If something catches fire in your microwave, keep the door shut and push the stop button. Opening the door will only fan the fire. If you keep a fire extinguisher on hand in the kitchen,, be sure you know how to use it properly. Choose a Class ABC extinguisher that is labeled by a testing lab. 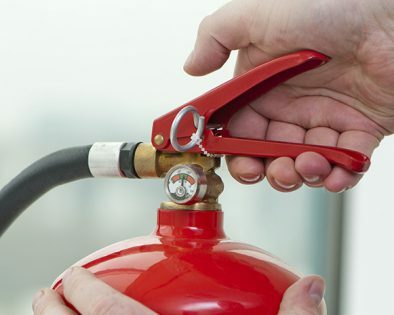 Follow instructions for operating the extinguisher — and use it only on small, contained fires. If a fire is big, or spreading, get out and call the fire department. If Clothing Catches Fire…Stop, Drop and Roll!! If your clothes catch on fire, do not panic or run. This only fans the fire. Stop where you are, drop to the ground and roll over and over to smother the flames. Cover your face with your hands to protect it and your throat and lungs from burns. If you , or someone else, gets burned while cooking, run cool water on the skin immediately. Keep cooling it until the burning sensation stops. This prevents continuing injury and alleviates some of the pain. Burns are often more serious than they first appear. So, if a burn is severe — charred or blistered — see a doctor as soon as possible. Don’t leave cooking food unattended. Never leave the kitchen while you have something cooking on the stove. This is how most kitchens fires start. Clean ovens, stoves and other appliances regularly. Old food particles and grease can ignite easily, starting a fire. While cooking on the stove, keep all pot handles turned in, so pots won’t be knocked off by accident or pulled down by small children. Loose garments can catch fire if they get too close to hot burners. Protect yourself and wear sleeves that do not drape off your arms while cooking. Do not plug too many appliances, such as electric frying pans, toasters and coffee makers into the same outlet. This can overload the circuit and cause an electrical fire. If cords are frayed or cracked, replace them before using. People can get burned by reaching over hot burners. Use the stovetop only for cooking. Also, make sure the wall covering behind and over your stove is not combustible and that curtains don’t hang near the stovetop. Remember to turn off coffee pots, toaster ovens and other appliances as soon as you are finished using them. They can overheat and start a fire. You’ve got a fire on your hands if a misplaced pot holder touches a hot burner. Be careful to place pot holders and dish towels at a safe distance from the stove. Combined, water and electricity can give you a shock. Make sure your hands are dry when using electrical appliances. Don’t stand in water while using an electrical appliance. If one gets wet inside, have it serviced. Always keep a careful eye on cooking oils while heating them. Never turn the burner on “High” and leave a pan containing oil unattended. Heat oil gradually.